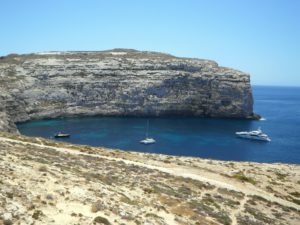 There are heaps of other guides for the best beaches in Gozo, but none of them really provide a local’s take on the beaches you simply must NOT miss during your stay. From secluded bays, to sandy coves and deep blue seas, Gozo’s coastline offers something for every swimming ability and adventure level. Here’s a list of the beaches we locals love and wouldn’t want you to miss. Literally a stone’s throw away from Pergola Farmhouses, Ghajn Barrani bay is a hidden little gem that only a few locals know how to reach. The Pergola Valley gives way to a small sandy beach with pebbled areas, and a sea so clean and clear, that you can study every colourful pebble at its bottom. Ghajn Barrani Bay is surrounded by the green of the valley and the clay slopes that lead to its neighbouring but far more popular Ramla Bay. Ghajn Barrani Bay is not reachable by car and it can get quite tricky in places if you intend to cycle down. The best way towards the bay is to trek it, the views are marvellous and the peace that awaits once you reach the shore is totally worth the trek. Leisurely off the beaten track, Wied l-Ghasri is a gem with two little boat houses carved in the cliff. It’s flanked on each side by beautiful cliffs with a narrow inlet of water leading out to the open sea. On one side is a little cave which you can swim in and wile time away. It’s not as popular with the tourists, so you’ll be making the most of the local way of enjoying the island. If you’re after super deep sea, a cooler temperature to ease the summer heat, and a sense of freedom the second you touch the water, then the Il-Port area at Dwejra Bay is the place to be. Nestled by the Fungus Rock and 180-degree cliffs, Il Port is reachable through a stone cut stairway. We admit, the climb upwards isn’t easy, but the swim to be had in this area is a memorable one. For marvellous views of the island of Malta, and a wide expanse of swimmable sea, Ix-Xatt l-Ahmar is another area you wouldn’t want to miss. You can drive towards the bay or else hike it down and make the most of the stunning views. There would be no such list without a mention of Ramla Bay. While the popular bay itself is beautiful, it can also get crowded, especially in July and August. If you’re not too fond of sharing a beach with hundreds of others, a short walk away along the coastline is Ix-Xtajta, a sandy cove, tiny, yet big on secluded beauty. Gozo’s beauty is unique; take the time to leisurely explore the island when on holiday. The most stunning spots are usually off the beaten track, away from the usual touristy hustle and bustle.